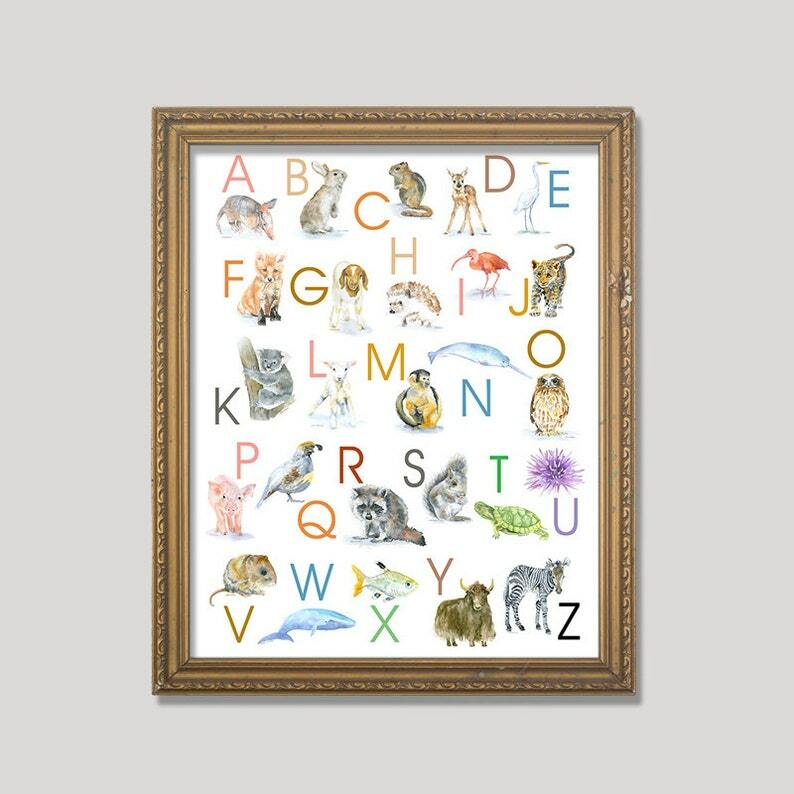 Animal Alphabet Print. Print measures 11"x14" portrait/vertical format. I'm so excited about this newest project. Finally, all 26 letters of the English alphabet have my animal paintings to match! So many individual prints of mine are already decorating sweet babies' nurseries. Now I love this idea to include the letters of the alphabet for your little one as she grows and learns! Printed on Hahnemühle Torchon 285 gsm Fine Art paper using archival pigment inks. This quality printing allows over 100 years of vivid color in a typical home display. Prints are sent in cellophane sleeve with cardboard in a sturdy mailer to protect it while shipping. Exactly what we were hoping for! All of our prints are perfect for our nursery! Thank you! Love the bluebonnets!!! Thank you! This is an Easter gift for my 3 year-old who loves lambs. It will go beautifully above his bed. Very lovely print and arrived in perfect condition. Couldn’t be happier! I accept PayPal and Direct Checkout with Etsy. Etsy Gift Cards are now available as well! Your immediate payment is appreciated! The state law requires that I collect 8.25% sales tax on all purchases sold in Texas. If you live in Texas and make a purchase from me, the sales tax amount will calculate automatically by Etsy. We can handle refunds and exchanges on a case by case basis. I want you to be totally happy with your purchase, so just contact me if there are any concerns. I will do my best to remedy the situation as soon as possible. Once your payment is confirmed, your package will ship from my studio in Lewisville, TX USA within 2-3 business days (unless specified otherwise) via USPS. International shipments: Please allow 5-6 weeks for item to arrive from the time it is shipped. Most of the time it will arrive much sooner, but we are dependent on the postal service and customs in your country. Refunds/replacement of items will not be issued for items lost in transit until 6 weeks after the shipping date. Customs and duty fees are the responsibility of the customer. If you have any questions about items in my shop, please don't hesitate to contact me. Just e-mail me at susancwindsor [!at] gmail.com or send me a convo through Etsy. I'm usually not too far from a computer and will be happy to communicate with you. Also, if there's something not listed that you think I can provide for you, please just send me a quick message. I'd love it if we could work something out!